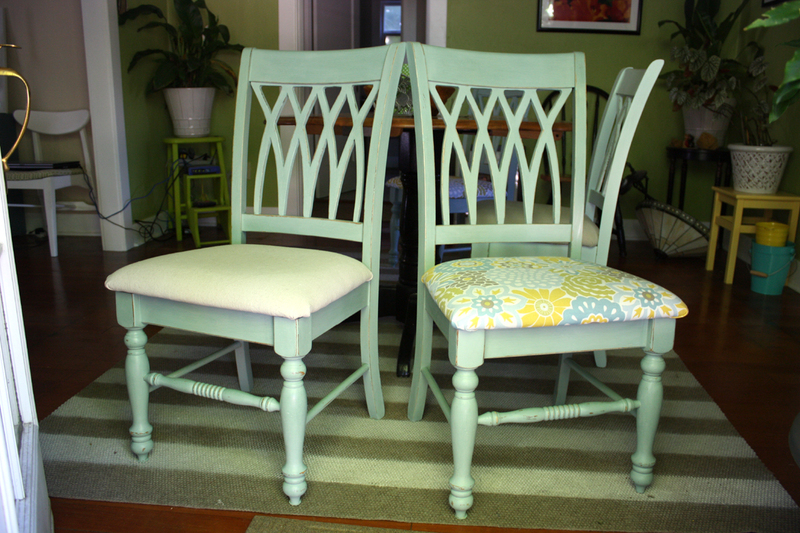 This past weekend I made another trip to the fabric store and drug Brian along to get his opinion on fabric to cover the dining room chair seats. As you may have noticed I like to get Brian's opinion on things. 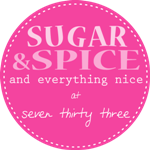 Not because I can't make up my mind (although that sometimes is the case!) but I like his input because I want him to feel as happy in our home as I do. Here you can see the fabric a bit closer-up. 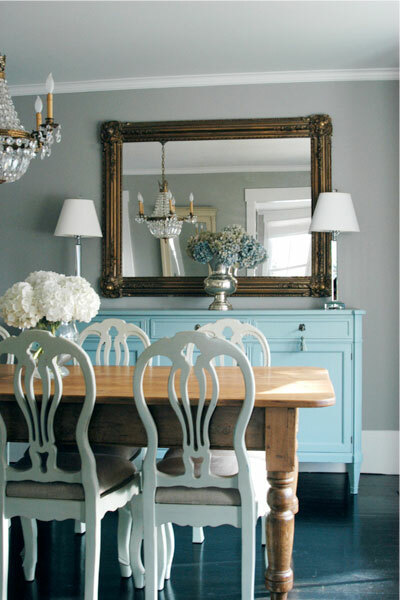 It has shades of blue, yellow, green to match the walls, and a bit of light-brown that ties in our painted rug. Here's the initial canvas fabric I tried next to the new fabric. 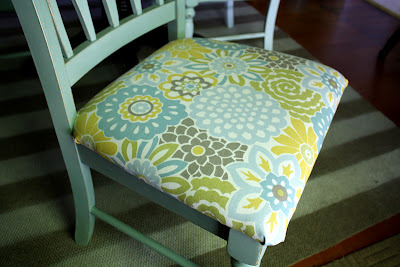 The old fabric is nice, but the new pattern is more fun and cheerful. I also think the new fabric goes a bit better with the shelf-paper stripes of the corner cabinet in the upper right of the picture, they play off each other well. 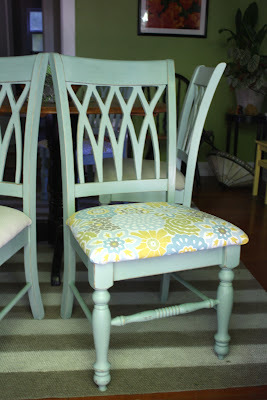 I love the fabric choice with the paint color - beautiful! They turned out beautiful! Love the colors! Thanks for the positive feedback and for stopping by! 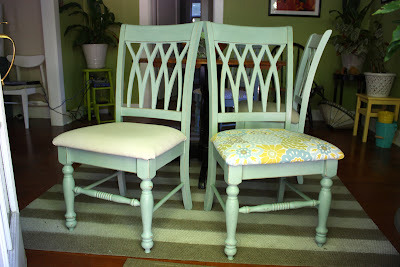 It's hard to capture the true colors of the fabric and chairs but we really like them. Way cute! Fun, fresh and full of style! Thanks everyone for the nice comments! I'm yard-saling this weekend so hopefully I will have some good finds to share ...... I'm dreaming of a new table! Hope everyone has a great weekend! Your fabric choice is perfect! It adds color without being over-powering. Can I ask where you found it??? Thanks! Thanks! I found the fabric at Joann's fabric store. 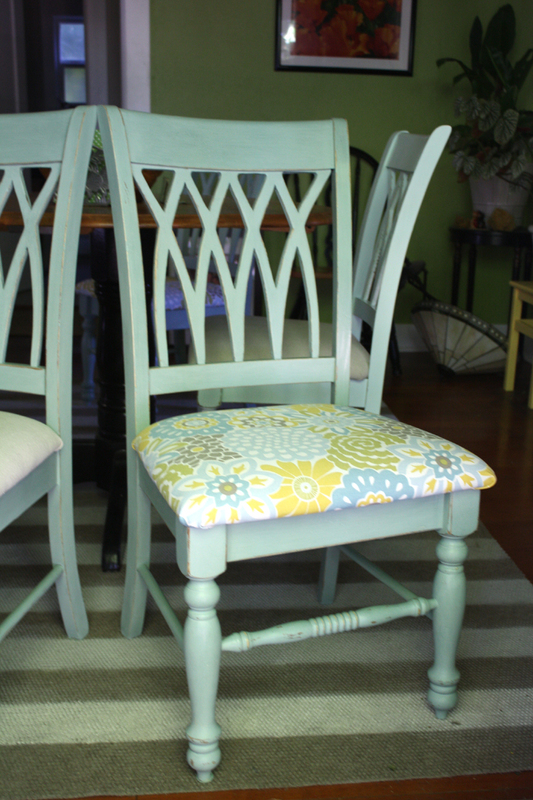 It is an outdoor canvas fabric so hopefully it holds up pretty well as chair covers.